Chayenu: Tell us a little about yourself and your background with Yiddishkeit? Jerry Fensterstock: I live in upper Westchester County, I retired about ten years ago, after a forty-year career at IBM. During that time I was fortunate enough to travel all over the world and had a variety of challenging assignments. But, I have to say, that during that period, my contact with Judaism was episodic, at best. I was the prototypical three times a year Jew. I was raised in a Conservative Jewish household where we kept Kosher and observed the holidays, but after my Bar Mitzvah my Jewish education remained frozen for the next fifty years. So, for most of my life, my appreciation of Judaism was through the eyes of a thirteen year old. CH: When did exposure to Judaism change? JF: That changed after I retired. I decided that I needed some structure in my day, and after reading about the new cycle of Daf Yomi that was about to begin, decided to give learning Talmud a go. Along with a group of friends, we began a Talmud study group. I found the Talmud to be absolutely fascinating. After I was in it for a while I came across an advertisement for a class at a local Chabad called “You Be The Judge.” It linked the Talmud to current legal issues. After a few sessions I was hooked. That led to numerous Chabad classes. As my knowledge increased, so did my level of observance at my Conservative synagogue. I was now attending services every Shabbat and taking adult education courses. After a fifty-year hiatus, my Jewish education had resumed in earnest. The ultimate expression of this is that now, after many years of study, I am teaching adult education classes at my synagogue in Talmud, Pirkei Avot and Tanya. A major milestone for me was attending the Siyum HaShas after completing the seven and a half years of Daf Yomi. When I started, I really had no idea if I would get all the way through. The Rabbi at my Conservative synagogue also celebrated the occasion by explaining to the congregation the nature of the accomplishment and giving me an aliya that Shabbat. Now I am on my second cycle and enjoying it even more. CH: How were you first introduced to Chayenu? JF: At some point, at the Chabad, I came upon a copy of Chayenu. I had no idea that such a publication existed. As I was now a regular synagogue attendee, theChabad Rabbi, Rabbi Levi Mendelow, suggested that I study the daily Chumash with Rashi as a preparation to the weekly Torah reading. It quickly became a regular part of my daily study regimen. Although, of course, I was familiar with Rashi from my Talmud study, reading his commentary on each day’s Torah portion gave me all kinds of new insights. CH: Which sections in Chayenu do you enjoy and why? JF: Rashi still continues to fascinate me. And so the Chumash with Rashi remains my favorite section. I find that the footnotes are also extremely informative. Associated with that, I also like the Daily Parsha Insights from the Rebbe. This year I started the chapter a day of Mishneh Torah and am finding that it is a great complement to my Talmud study. I also find that the HaYom-Yom provides some wonderful tid-bits of wisdom from the Rebbe. Each year I try to add a new section to my daily reading program. CH: How has Chayenu positively affected your life and those around you? JF: As I mentioned earlier, Chayenu has become a part of my daily study program, along with Daf Yomi and Tehillim. I find that having this block of time set aside provides an anchor of stability in an otherwise hectic day. Since retiring, and getting reconnected with Judaism, I have become very active at my synagogue as well as at Chabad. 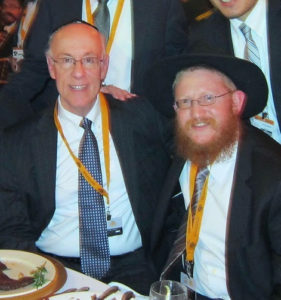 Under Rabbi Mendelow’s gentle tutelage my involvement with Chabad has now grown to include attending the annual kinus of Shluchim, frequent trips to the Rebbe’s Ohel and attendance at JLI retreats. My daily study of Chayenu has given me a foundation of knowledge that forms a basis for an increasing range of activities. I am participating in, or running programs on a regular basis. Being able to sit down with Chayenu is something that I look forward to each day. I know that for that period of time I can be totally absorbed in Jewish wisdom. For all the years I was working, I spent the majority of my day trying to improve the fortunes of my company. Now, with my daily study, I can spend my time trying to improve myself. Chayenu is a major part of that effort. CH: Where is the least place you expected to experience Chayenu? JF: Several years ago my wife and I took a trip to China. As the digital version was not yet available, I made sure to take the next three weeks’ books with me. I assume that I am the only person to have ever flown from Xian to Beijing while reading Rashi’s commentary during the flight. CH: Do you have an interesting experience to share about Chayenu? JF: About three years ago I started a parsha discussion group at my synagogue before services on Shabbat mornings. In leading the discussion I rely heavily upon the Rashi commentary in Chayenu. I also draw upon the parsha overview. In addition, I often bring in one or more of the Rebbe’s parsha insights. After several months of this activity, some of the attendees started asking me what was the little magazine that I was reading from? So, I introduced a bunch of Conservative Jews to Chayenu. At this point, a number of them have subscribed and read it regularly. This has dramatically enriched the level of the discussion. CH: What would you say to people who have not yet subscribed to Chayenu? JF: Chayenu is the most effective way to implement a self-study program to raise your level of Jewish knowledge. Daily study is at the heart of being Jewish. And Chayenu brings it right to your doorstep. What are you waiting for?